to you is born this day in the city of David a Saviour, who is the Messiah, the Lord. These days, driving from Cork to Dublin, we’ve become used to the new motorways, M8 and M7. Those of us of a certain age no longer see some of the landmarks of that journey. Our children, newcomers to these parts, or younger people, might never have seen them at all. No longer do we drive through all those towns and villages that we once came to know so intimately, albeit latterly, in long lines of traffic, which we certainly don’t miss . The first town to be by-passed altogether was Cahir, and Cahir Castle in 1991. For years afterwards my parents defiantly still drove in to Cahir because that’s where they took their first break: coffee at The Crock of Gold. Some landmarks we can still see from the new roads: such as Corran HIll in this County with its cross on top, the Curragh with its racecourse. We still catch glimpses of some of the towns as we pass: Fermoy and Mitchelstown. Some famous landmarks can still be seen, but you have to make an effort to look for them: the Rock of Cashel, and St Brigid’s Cathedral, Kildare. The new road also manifests for us some things we didn’t used to see from the old road: a glimpse of the tower of Rockwell College. But all the familiar landmarks are still there, even if we no longer see them in the ways we once did. In the last two weeks, for the first time in years, in the course of my pastoral work, I had cause to have to leave the M7 at Port Laoise, and to drive along the County Laois section of the old road to Cork. So many memories came flooding back: familiar places and pointers to the past. A stretch of road where a friend died in a car accident. Abbeyleix with its long street and picturesque buildings laden with history. A long stretch of road with forestry either side. The village of Durrow, with the café where we sometimes stopped, and its church beside the village green. A restaurant popular for breakfast, particularly for truck drivers and their helpers. When I worked on delivery trucks for a long university summer we used to stop there. A garage owned by a cousin’s husband. That big village in a dip: Cullahill. And onwards towards Urlingford where, pastoral work done, it was back to the new road. Memories came flooding back, and I saw familiar things again, and some of them in a new way. The Christmas visit to church is little different. We travel on an old familiar road and hear once more the resonances, and see the landmarks, of the Christmas story. In those days … a decree .. Emperor August … all the world should be registered … Joseph also went from the town of Nazareth … to Bethlehem. While they were there the time came for her to deliver her child … she gave birth to her firstborn son and wrapped him in bands of cloth, and laid him in a manager, because there was no place for them in the inn. Earlier this week, the RTE programme ‘Christmas Then and Now’ began with the presenter saying ‘Christmas is a time of nostalgia when we all dust off our childhood memories and delve into our past’. Very true, but for adult Christians, Christmas has to go beyond hearing again the Christmas story as it was handed on to us in our childhood, at home, school or Sunday School. For the Christmas story is told anew and the Gospel is proclaimed afresh in every generation, in a particular time and in a place; announced to all that is going on in that time and particular place, with all its opportunities and conundrums, hopes and fears. Two surveys were conducted in England recently about traditional nativity plays. One survey conducted by Netmums showed that only one third of schools there opt for a traditional nativity play. Others include (according to the report) ‘…punk fairies, aliens, Elvis, lobsters, spacemen and even recycling bins, … and also … children dressed as ingredients in a Christmas lunch including carrots, sprouts.’ Can you imagine the indignity being a sprout? The Church Times reports that one child was dressed as a ‘carrier bag’, and another as a ‘fried egg’, and yet another as a crew member of the Starship Enterprise. There were adaptations too based on The Apprentice and Strictly Come Dancing: interesting! It seems that some churches are exploring it all in new ways. According to a report in this week’s Church Times, ‘the customer-service manager at Ecclesiastical Insurance, Helen Richards, said last week that churches were “getting more and more adventurous, more and more innovative ..”. Ms Richards said: “We always get donkeys this time of year, with questions about whether it is OK for them to come into church. This year, we’ve actually had a request for advice on bringing camels into church, which is a first.’ Next year, Mr Dean? However, the second survey for Families Online found that 77%, the vast majority, of parents, would prefer schools to return to telling the story in the traditional way. The traditional way, of course, does not rule out new things, as we see year by year here in this Cathedral with, for example, the Festival of Nine Lessons and Carols. This year, we even had a beautiful new carol written and composed by our own Director of Music, Peter Stobart: A night full of promise. ‘What a night, what a night, full of promise, what a night full of mystery, when the Lord was born. What a star … What a fear of the Shepherds … Glory to the Christ Child, and Worship the King!’ It was new that the proceeds of sale – traditional CDs and online on iTunes – were shared with the Simon Community. A friend asked me recently how come it was that, if Joseph and Mary had been warned by God in a dream not to go home the same way, but to escape to Egypt for the sake of their new baby, how come they didn’t warn everyone else as well so that the slaughter of the innocents could be avoided. Good question, but only if you are seeing the Gospel accounts as historical fact, or treating them like the picture storybooks of our childhood. Many find it difficult in adulthood to keep on believing, in part because we do not give them tools, or the courage, in the life of faith to read and engage with the scriptures in a fresh and critical way. This is especially true of these stories of the birth of Jesus – those who wrote them already knew about the crucifixion and resurrection, and so, inspired by the Spirit of God they were deliberately writing in a way to help others to believe and to understand; God-inspired spin-doctoring was going on, to help us, in faith, to understand what it all means: – ‘the Word made flesh’ – so that we would come to know this Jesus who is himself the Word. More than that I am happy to say that we now have approval from the Pontifical University in Maynooth, to deliver right here, throughout this Diocese, their Certificate in Christian Studies. A certificate level course (NFQ level 7) that enables and empowers ordinary people of the Church to explore these questions in an engaging and accessible way. The course will begin in 2018. As well as providing a toolkit to support personal discipleship, the course will also be a building block for all sorts of forms of ministry, lay and ordained. In our time and place there’s a lot to be done, in God’s name. Motivated by the great commandment – ‘Love God, Love your Neighbour’ -which Jesus gave to us, there are injustices to be put right, inequalities still to be addressed, bridges to be built, hurts to be healed, love, peace and solidarity to be offered. The good news of Christmas needs to be shared and implemented all the year long; the good news that God is with us. 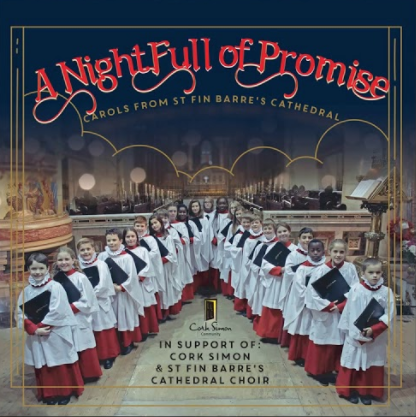 ‘A Night Full of Promise’ to which the Bishop referred in his sermon may be purchased online on iTunes, and the CDs can be found across Cork City including Golden Discs, Oasis, Liam Ruiséal, Pro Musica, as well as Saint Fin Barre’s Cathedral shop. All proceeds are shared between the Simon Community in Cork, and funds to support the work of the Cathedral Choir. This entry was posted in Bishop, Cathedral, Christmas, Church Music, Church Services, Sermons. Bookmark the permalink.